I grew up in Washington State and gained an appreciation for geology climbing mountains in the Cascades and Olympics. As an undergraduate at the University of Rochester, I wrote a thesis on the geochemistry of anomalous crater in the Bolivian Altiplano. I went on to graduate school at Brown University after two years in geotechnical and environmental consulting. My dissertation focuses on the physical and chemical evolution of the lunar and terrestrial mantles, and includes chapters on experimental petrology, rock deformation, and the trace element geochemistry of ophiolitic peridotites. 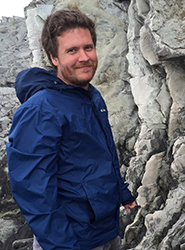 I moved on to a postdoctoral fellowship at UT Austin, where I acquired experience in numerical modeling and synchrotron-based experimental techniques, and worked on deformed peridotite xenoliths and an enstatite achondrite. I use experimental and field investigations to understand processes that shape the evolution of planetary interiors and crusts, and to interpret their expressions in the rock record. Dygert, N., Kelemen, P., Liang, Y. (2017) Spatial variations in cooling rate in the mantle section of the Samail ophiolite in Oman: Implications for formation of lithosphere at mid-ocean ridges. Earth and Planetary Science Letters, doi:10.1016/j.epsl.2017.02.038. Zhang, N., Dygert, N., Liang, Y., Parmentier, E.M. (2017) The effect of ilmenite viscosity on the dynamics and evolution of an overturned lunar cumulate mantle. Geophysical Research Letters, doi:10.1002/2017GL073702. Dygert, N., Liang, Y., Kelemen, P. (2016) Formation of plagioclase lherzolite and associated dunite-harzburgite-lherzolite sequence by multiple episodes of melt percolation and melt-rock reaction: An example from Trinity ophiolite. Journal of Petrology, doi:10.1093/petrology/egw018. Dygert, N., Hirth, G., Liang, Y. (2016) A flow law for ilmenite in dislocation creep: Implications for lunar cumulate mantle overturn. Geophysical Research Letters, doi:10.1002/2015GL066546. Wang, C.G., Liang, Y., Dygert, N., Xu, W.L. (2016) Formation of orthopyroxenite by reaction between peridotite and hydrous basaltic melts: An experimental study. Contributions to Mineralogy and Petrology, doi:10.1007/s00410-016-1287-z. Dygert, N. and Liang, Y. (2015) Temperatures and cooling rates recorded in REE in coexisting pyroxenes in ophiolitic and abyssal peridotites. Earth and Planetary Science Letters, doi:10.1016/j.epsl.2015.02.042. Dygert, N., Liang, Y., Sun, C., Hess, P. (2014) An experimental study of trace element partitioning between augite and Fe-rich basalts. Geochimica et Cosmochimica Acta, doi:10.1016/j.gca.2014.01.042. Dygert, N., Liang, Y., Hess, P. (2013) The importance of melt TiO2 in affecting high field strength element partitioning between Fe-Ti oxides and lunar picritic glass melts. Geochimica et Cosmochimica Acta, doi:10.1016/j.gca.2012.12.005. Wang, C.G., Liang, Y., Xu, W.L., Dygert, N. (2013) Interaction between pyroxenite-derived melt and peridotite: laboratory dissolution experiments with applications to mineral compositional variations in mantle xenoliths from the North China Craton. Contributions to Mineralogy and Petrology, doi:10.1007/s00410-013-0938-6.